Presented by Phil Moakes & Maggie Gregory. Station To Station is all about going places & doing stuff and often involves trips to nearby towns, and attractions. It’s all about a grand day out. 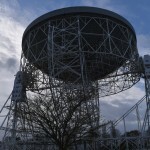 - A visit to Jodrell Bank. Jodrell Bank is the site of one of Britain’s most iconic structures and still, after 70 years, a hub for astrophysics and space discovery. In the show we talk to an astro physicist about the Orrery (a clockwork model of the solar system), hear the sound of the Big Bang and whisper to each other through the parabolic antennae, from one side of the field to another. Please note – this is a pop up show, recorded on location, not in a studio. 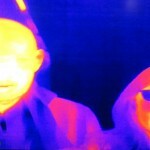 Click on the Infra Red photo below to see how the Jodrell bank IR camera ‘thermally imaged’ Phil and Mags.